Click the Sample Audio button to listen to a story from the Passion of Christ Easter Story. What will the Roman soldiers tell the governor after seeing the angels of the Lord proclaim that "He Is Risen!" Rejoice with blind non-believers who were RECLAIMED! by Jesus to see again, literally and spiritually! Share the astonishment of Mary and Martha as resurrected Lazarus is RECLAIMED from death and the tomb! Marvel how impetuous Peter was RECLAIMED from his guilt and found peace; however Judas, the betrayer of a Friend, found ruin. Volume 6 RECLAIMED! features many of the most famous Bible stories including the Easter story: The Passion of the Christ when Jesus was crucified, was buried and rose again. This set of CDs also features many other parables such as the parable of The Prodigal Son, and The Good Samaritan. THE BIBLE IN LIVING SOUND's audio dramatizations are reenacted events of the Bible that captivate listeners of all ages as they visualize and learn the values taught in God's Word. Listen to the Bible ... in living sound! Listen to the dramatized Bible stories from the Lazarus to Jesus' death on the cross in RECLAIMED! 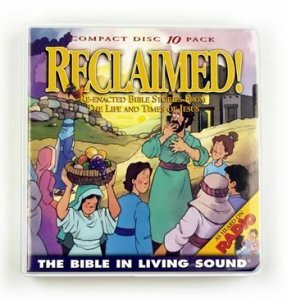 60 dramatized audio Bible stories on 10 CDs in RECLAIMED! Use Exploring God's Book 3 workbook as a Bible study workbook for personal study, church, Sunday School and home school curriculum for SAVED! Volume 5 and RECLAIMED! Volume 6.